A short time ago we posted about the World Chess Championships of 2018. Both champions managed to retain their titles after tough struggles in both competitions. Congratulations to women’s champion Ju Wenjun, who won a KO tournament, and to Magnus Carlsen who defeated challenger Fabiano Caruana in a very unusual match. 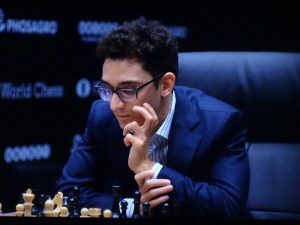 Carlsen and Caruana both had their chances in the 12 Classical games of their match but both players defended well under pressure. The result: all draws and a 6-6 tie! They then went into the Rapidplay tiebreak games, which Carlsen dominated, winning 3-0. There has been plenty of discussion regarding the format. 12 games is not the best number; it makes for a very short match. 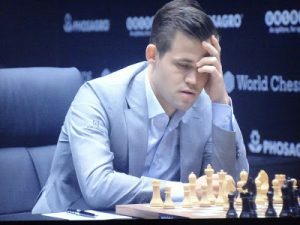 It seems the days of a standard 24-game match – with the champion retaining the title of the score ends 12-12 – are long gone, and only chess fans with long memories will remember the days of a player needing six victories, with draws not counting. This proved to be impractical in 1984 when neither Karpov nor Kasparov could win six games and their match was abandoned after 48 games. Deciding a title match with Rapidplay games is not satisfactory, yet Carlsen has now won twice with such games (against Karjakin in 2016 and now against Caruana). If the Rapidplay games had ended 2-2 then Blitz games – and even an Armageddon game – were waiting in the wings. The press had fun comparing the tiebreakers to a penalty shootout in football, but is it really the best way to decided the ultimate chess title? There are already world championships for Blitz and Rapidplay. Perhaps it is time to switch to a tournament instead of a match, but such a plan would meet with resistance. The chess world has two years until the next title match. Who will be Carlsen’s next challenger – and will the format change?